Why Does Old Wood Turn Gray? Is the cedar roof protecting your house grayer than the sky on a rainy day? If you were to look at a picture of your roof the day it was installed and compare it to what it looks like today, we’re pretty confident you’d be upset at the difference. We want to explain to you why this happens and then offer you a solution to fix this ugly problem. When you’re in the sun for too long, your skin will begin to change colors due to the effects of UV light. The same principle applies to wood that’s exposed to the sun. However, instead of the skin pigment changing colors, the cellulose fibers that make up the wood will begin to degrade and deteriorate. Over time, roofs with wood shingles will begin to turn gray due to the constant exposure to UV light. You cannot prevent your roof from being exposed to UV light, but you can treat the wood shingles to help restore those fibers. This will help keep your roof looking new, instead of a lifeless gray. When it rains and snows, the moisture can begin to negatively affect wooden roof shingles as time goes on. New roofs with high quality materials (that are properly installed) are unaffected by precipitation. However, as time goes on, constant UV light and fairing against the elements will cause shingles to become weakened. 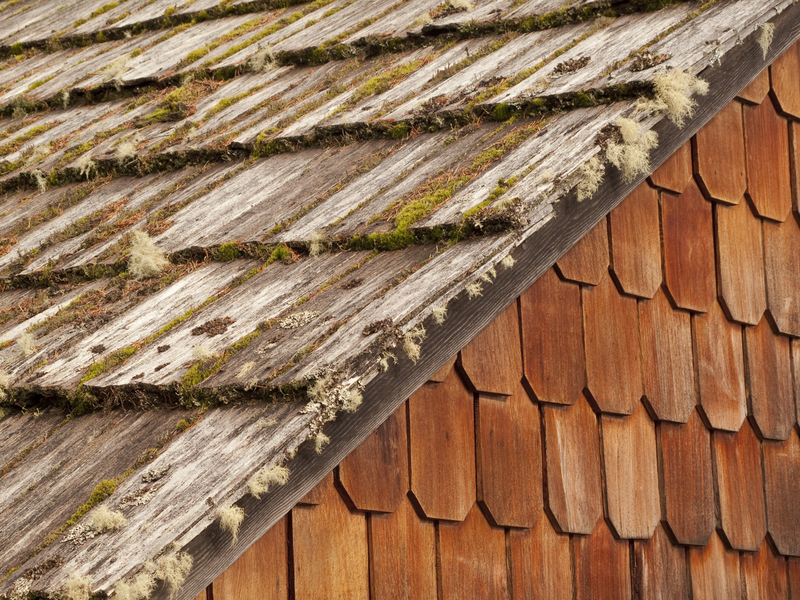 As wooden shingles weaken over time, they will become susceptible to the growth of mildew and other fungi. This can discolor wood, causing some areas to become darker or lighter than others. In addition to the loss of color from UV light, the growth of mildew will further the discoloration. You can’t cover your roof to protect it from UV light or moisture, but what you can do is have it treated every few years. Cedar-Life is a treatment you can have applied to your cedar shingles that will preserve the wood and delay the negative effects of the sun and precipitation. A cedar roof that is left untreated may need to be replaced after 10 to 15 years. Having your cedar roof treated with Cedar-Life every few years can easily increase this lifespan to the range of 35 to 50 years! Cedar-Life is a proprietary process designed and implemented by the pros here at Landmark Exteriors. So when you want to breathe new life into your roof and up your curb appeal, be sure to give us a call! Author adminPosted on November 14, 2018 Categories UncategorizedLeave a comment on Why Does Old Wood Turn Gray?